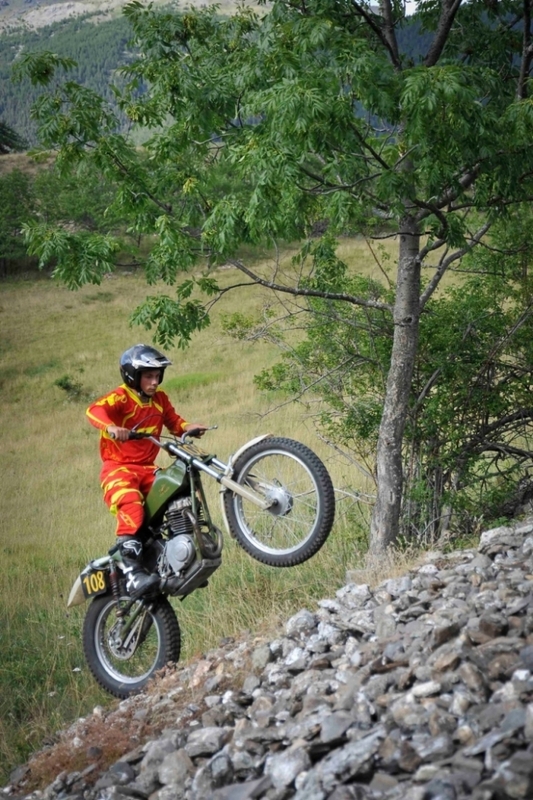 Justyn Norek's second trials test. This time the Italian Job. 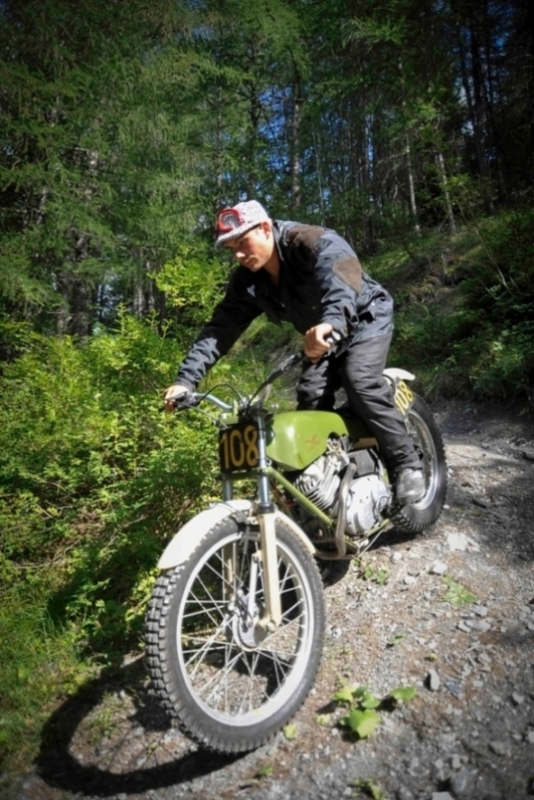 Moto Guzzi Classic Trials Machine Test. The Justyn's Norek have sent me the second of their Trials Tests . This time , What could have been a superb factory built Moto Guzzi trials bike? But the factory were not intrested in production. Anyway here are the pictures and the story. This is one of the prettiest bikes I have seen, for a long time. Here is the story. by Justyn. Here is short story of Giuseppe "Pippo" Bartorilla. 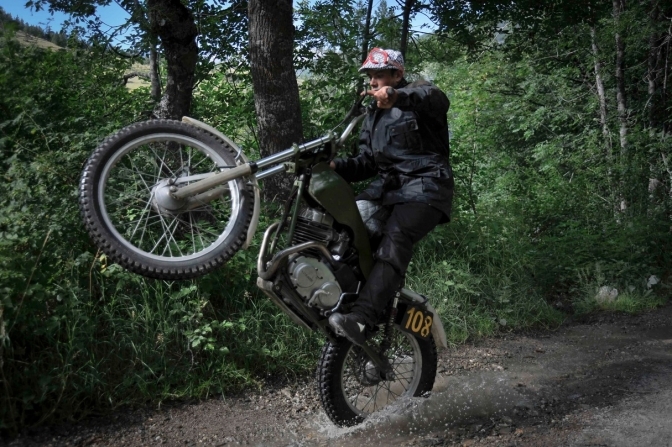 GIUSEPPE "PIPPO" BARTORILLA is one of the best Italian trials riders in 70's. As all trials riders he started to ride early and quickly fell in love with trials sport that remain his passion up to today! 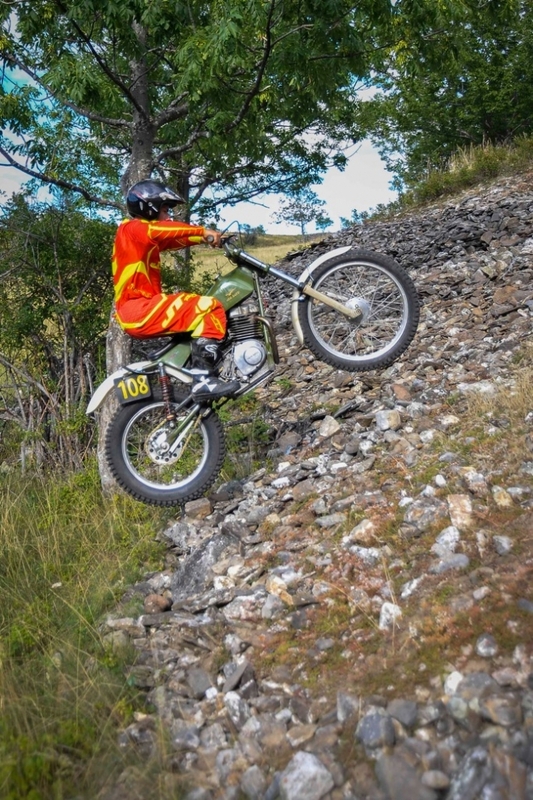 His first competition was in 1970 on Bultaco Matador Mk II when he was 23 years old. Next year he had to do military service and sold his bike. 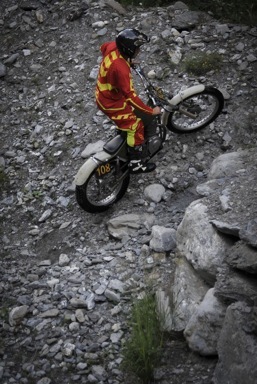 But he was back in competition in 1973 with his new OSSA MAR, bike most popular of that year. 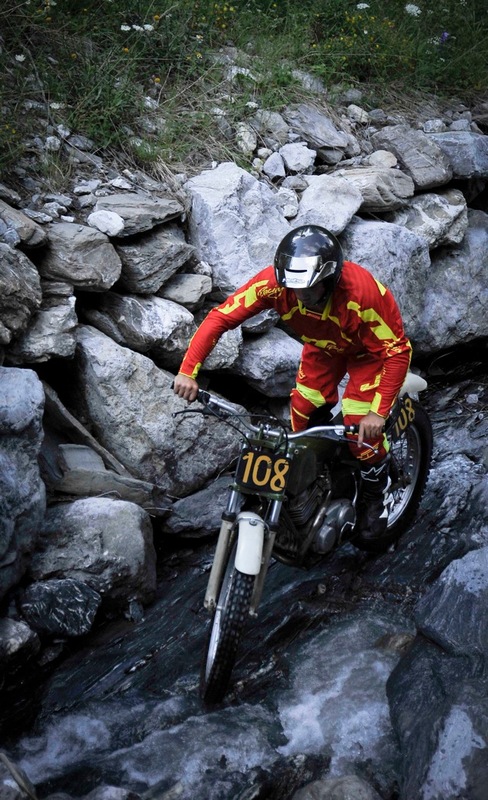 Ignacio Buòto who was travelling in Italy on promotional tour, has noticed his talent and offered him works Bultaco, thus 1974 he was riding again on Bultaco and competing in Italian Trials Championships, he wins his first race in Italian Trials Championship.Thats 1975. And rode 348 also next years, on which he took part in 1977 Scottish Six Days Trial winning first class award. At the end of season he met old friend Carlo Colombari, ex motocross racer and later ex mechanic of MOTO GUZZI and together they started thinking to build special motorcycle for trial competition with 4-stroke engine! They wanted to test and get an experience of that kind of bike with an engine offering lot of traction and capability of slow motion power due to characteristics of four-stroke engine. For this reason their choice of an engine is MOTO GUZZI Stornello! Still trial is not acrobatic and extreme as it happened later on. 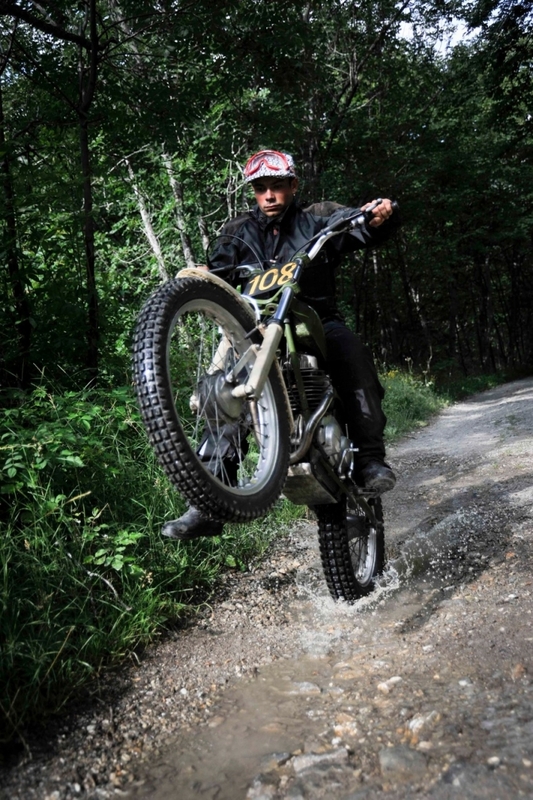 To these two joins also Gigi Pegorari, also good trials rider who owns Montesa Cota and always train with Pippo. Rear part of frame completely new and engine with new cylinder increased capacity to 220 cc from Stornello's modest 175 cc. Lot of weight was shaved down to 84 kg thanks to frame very compact with modified steering angle, as well as lot of work has been done on suspension, with Marzocchi ultra light magnesium front forks and BITUBO experimental aluminum rear shocks, light fiberglass tank combined with seat base, Spanish made wheels and all bolts and nuts in titanium done by Poggipolini. 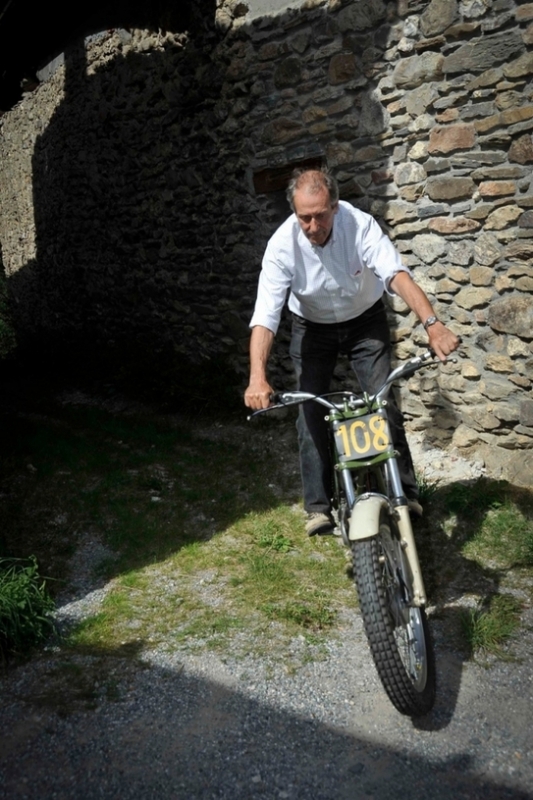 These red painted Moto Guzzi create lot of sensation in trials, especially after win in debut. Pippo finishes season at 10 place. In 1979 Pippo decide not to participate in Italian Championship and takes part only in selected events on Bultaco Sherpa offered him by Italian Bultaco imported Leopoldo Tartarini and that decide to take part in SSDT on his beloved Moto Guzzi. 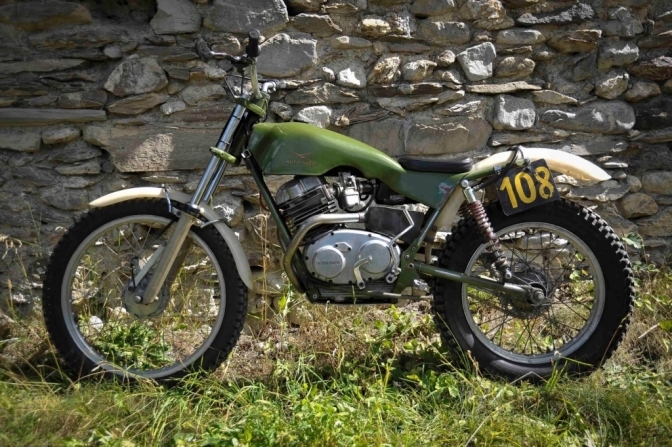 So at the start of SSDT there appear two identical Moto Guzzi trials, creating quite a sensation and rumors that famous Italian bike company is interested in Trials! With this bike PIPPO BARTORILLA rode SSDT in 1979 creating quite a sensation with his modern 4-stroke trials bike, bearing glorious name, going pretty well until last day when his Guzzi stopped due to petrol leaking into oil tank, thus thinning oil and finally causing engine seizing. Second Guzzi did Gigi Pegoraro finishes in first class awards. I was GREAT result considering it was not factory but private effort, with very limited resources. Seat base integrated. Of course having high four-stroke engine shape became very distinct and particular thanks to Pippo' s sculptural skills. Colour of bike camouflaging it with green landscape.... what a vision! Only 12 bikes were built, other bikes having red fuel tanks. Colombari has built those bikes for himself, for his two riders and his 3 brothers as well as one sidecar used by Pippo Bartorilla in selected events. Moto Guzzi never had any interest to enter into trials bikes market, so it was exclusively Colombari-Bartorilla-Pegoraro effort. 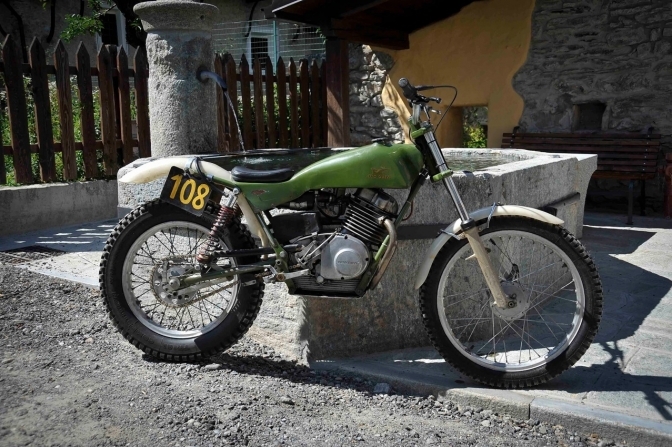 Today he still rides for pleasure and has modern Cota as well as some vintage trials bikes like for example rare ELLIOT HONDA and CCM 350 TRIAL; we hope to test some them in August.. This is "Pippo"Bartorilla, Riding the superb Moto Guzzi. I have found immediately riding position suiting me very well. That clutch released and lets go into woods to get feeling of this bike. I quickly felt at home on this bike being quite familiar with four stroke engine as I offer ride my Honda RTL. Response from engine was excellent and power sufficient to do wheelies whenever I wanted. Feeling very much at home and confident with bike. Also riding in water of the stream was pleasure and bike handled very well on slippery sections. And lifting rear wheel. Also lot of "clutching" that I am used to with my Honda didn't seem to bother my Guzzi. I have seen some sign of surprise and admiration on Guzzi' s owner face, that so many modern tricks can be performed with his bike. So after few glasses of wine I have asked Carlo, do you want to sell this one? Unfortunately despite two bottles of table dry I have got short "no", but you can ride whenever you want! So I asked him for next test of tiny SUZUKI 120 cc trial that I am very curious to test. 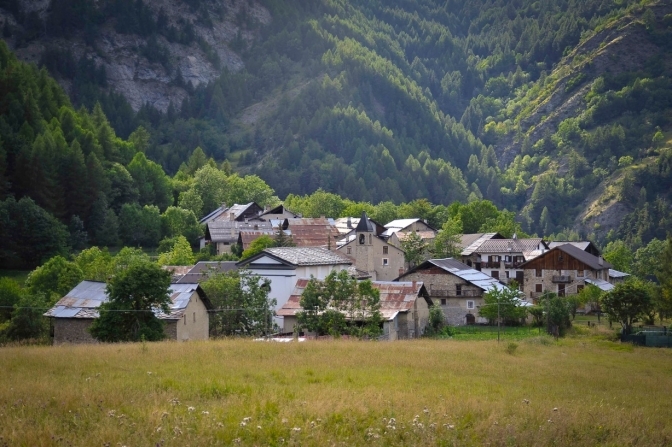 I will have it as soon as snow will melt in PUY. Justyn Jr on the first test of the bike. The second test was a bit more engaging. Superb! Shot Justyn, of a Superbly built machine. Moto-Guzzi, another case of what could have been. 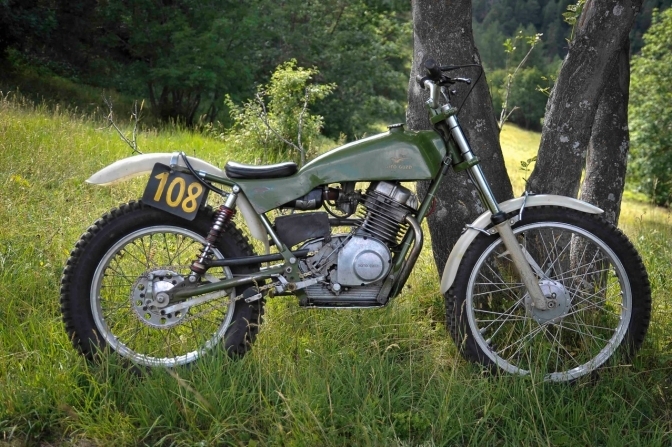 Not just a trials bike but a work of metalsmiths art. Update Later and more Photos.